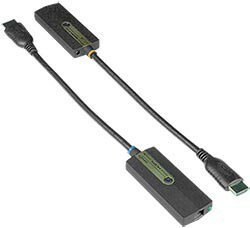 Also known as: HDMI Optical Extension, HDMI extender, HDMI digital to multimode fiber, optical extender, graphic extension modules, fiber optic digital video extender, hdmi over fiber balun. Signal transmission via single-strand multimode SC fiber optic cable – no RF interference. Compact and durable design — allowing for easy connection and placement. Transmitter: powered from attached video source. 980 feet (300 meters) over 50µm or 62.5µm multimode SC fiber optic cable. Use a simplex SC multimode 50-micron fiber optic cable (FIBER-S-SCSC-50-xxM) or 62.5 micron fiber optic cable to extend the receiver from the transmitter up to 980 feet (300 meters).